Chris Botez is questionable for tonight's home game against the Pennsylvania Quakers at the Stan Sheriff Center. Fittingly, the University of Pennsylvania basketball team is approaching its trip to Hawaii as an educational opportunity as well as an athletic endeavor. The defending Ivy League champion Quakers are on Oahu this week for games against Hawaii tonight and Brigham Young-Hawaii on Saturday. In between, they plan to make the most of a rare trip to the islands. "It's a great opportunity to come to Hawaii and not only enjoy the history and tradition of the place, but also to play college basketball," Penn coach Fran Dunphy said. "So we feel pretty fortunate to do both." The Quakers (3-4) face UH (7-3) in the first meeting between the schools tonight at the Stan Sheriff Center. Tip-off is set for 7:05 p.m. They'll end their stay with a game at BYUH's Cannon Activities Center in Laie on Saturday. The Rainbow Warriors and Quakers enter tonight's game with contrasting dilemmas. 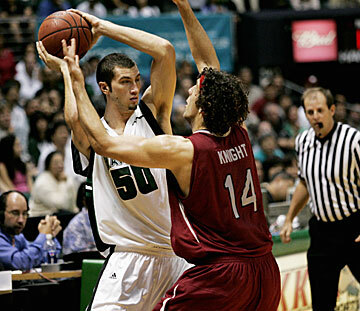 UH is playing its sixth game in the last 13 days, and have gone 4-1 so far in its homestand. Meanwhile, Penn hasn't played in 16 days. The Quakers last took the court Dec. 13 against Villanova, losing 62-55. The wear of UH's holiday-season grind is starting to show as the Rainbows slogged through Tuesday's game against North Carolina A&T and escaped with a 66-60 win. A shortened bench due to various injuries over the past week hasn't helped matters. "They're tired because of numbers and the amount of minutes they've had to play and the way substitutions have gone," UH coach Riley Wallace said. "But we're still winning, so that's good." With the Western Athletic Conference season starting back up next week, the Rainbows are searching for the energy that spurred them early in the season. "We need to get it before the conference," forward Ahmet Gueye said. "Because when the conference starts we're going to start traveling, and we'll have school and all that type of thing. It's going to be tough, so we have to get it right now." The Quakers' trip is part of a tough nonconference schedule highlighted by games against two of the nation's elite programs. Penn visited storied Cameron Indoor Stadium on Dec. 7, where they fell to top-ranked Duke 72-59. The Quakers then took on No. 3 Villanova, losing by seven points. With those experiences behind them, Dunphy is looking at the Quakers' games in Hawaii as a gauge of just how much the early tests have impacted his team's development. "I think (tonight) gives us an indication of how much it's helped us," Dunphy said yesterday. "Playing at Duke was really a positive experience for us. Playing in front of that crowd was great. Playing Villanova, as talented as they were, was great. "To come here to Hawaii and see a great state and play against a real good basketball team has got to help us at the end, but we have to treat it the right way." The Quakers certainly had to travel a long way just to get to the islands. But playing in the Ivy League usually means facing some extra challenges. Gaining acceptance to the university is a feat unto itself. Then there's keeping up with a rigorous course-load while concentrating on basketball at an institution that doesn't offer athletic scholarships. The team also takes an annual break during final exams and the Christmas holiday, limiting the amount of practice time available at this time of year. "We have a situation where we try to look at practice times that might fit for guys, who might have an hour on Tuesday or an hour on Wednesday," Dunphy said. "In that hour we may only get six or seven or eight guys." Through it all, the tradition-rich Penn program has won 23 Ivy League championships in the last 40 years, including nine over the last 13 seasons. "They don't make a lot of mistakes," Wallace said. "That's the way they play, not because they're in the Ivy League, but because of the way they're coached. They don't make a lot of mistakes and they make good decisions." "Because of the academic standards, you have to respect their game," he added "Their game fits them perfectly for what they recruit." The Quakers returned four starters from last year's 20-9 team and are led by junior guard Ibrahim Jaaber, who averages a league-best 18.9 points per game. Botez back: UH center Chris Botez returned to practice yesterday after sitting out Tuesday's game. He was diagnosed with costochondritis, an inflammation of the muscles between the ribs. He had a bone scan yesterday which did not reveal a cracked rib and suited up for practice wearing a protecting brace. He is listed as questionable for tonight's game.